They're here! I found out this evening my thesis has been in since Tuesday and, for whatever reason, I didn't get the email that announced their arrival. But, they're here and I have them today thanks to my awesome bestie Melanie, who came out to the house at 7:25 tonight to take me to the library and get them, even though the library closed at 8:00 p.m. and stopped serving the circulation desk at 7:45 p.m.! We barely made it, but then it was like 7:00 p.m. before I even learned they were there, just waiting for me. She's awesome. Thanks again, Melanie!! She even helped me carry them. My cut of the 13 printed copies is 11 copies, one of which has an original signature page. Took me a minute to figure out which one it was, since the original is in black and so are the copies. But, we put our heads together and figured it out. (~.^) So yeah, it was quite a bit to carry, but we managed. This was way back in June & July, when I was preparing for my defense and printing my bindery-ready copies. I thought I'd never be happier than that day, when I finally turned all of this in--though driving home I nearly had a panic attack thinking they'd find something wrong with all of those copies in the envelopes. I'm so paranoid. Either way, I was one happy woman when I got that thing off my plate and into the grad office. But I was wrong. I can be happier. And it came right on the heels of being so bummed. Melanie and I were chatting online this evening when I mentioned them coming in. You see, Melanie turned her bindery-ready copies into the grad office today--yay, Melanie! She mentioned that one of my co-students, Marsha, had hers and had since early in the week. Wait, back that truck up... what? So I got in contact with Marsha and she said mine were there too. I'd somehow managed to miss the letter (since it didn't come to me, GRRR!!). That's when Melanie came to pick me up and completely made my day. . . no, month. . . no, year, really! Check it out. . . Woo hoo!! I am so, so happy right now, it's unbelievable, and though I know these sorts of roller coaster ups and downs aren't really great for my emotional state on the whole, I feel like I should hang on to whatever can bring me happiness. And, honestly, I feel like I have earned the right to be crazy happy about this. So, I am. . . crazy happy, that is! Currently, I have a copy going to my folks and my in-laws, I gave one to Melanie, and I have one for each of my committee members--Dr. Young, Dr. Chappell, and Dr. Shipman. Going to try to get around to Tarleton this week to give them those. Then, I have a copy (with original signatures on bond) for myself. That leaves four extra copies, which I decided to go ahead and get at the time because they were only $12.50 per copy, as opposed to $55.00 per copy later. So yeah, it was a sound investment, just not sure what I'll do with the originals yet. We'll see. So, would you judge me if I told you that I've already put up my Christmas decorations? If so, it's okay, I think I'd judge me, too. I think I am judging me, because, yeah, I put up my Christmas decorations today. Matt and I have, for the last several years, had a tiny little Christmas tree. It's like a 2' tree, it sits on the dining room table, or the top of my grandma's sewing machine, or wherever because, well, it's tiny. That's what tiny Christmas trees are for, to sit around on tables and look cute. But, those little trees have some serious drawbacks, like that they need teensy tiny little ornaments, you can't use a full-size tree star, and a full-size tree skirt looks utterly ridiculous. Of course, they also have their advantages. For instance, I haven't decorated that little tree in years, either, because it's small enough to cover with a large trash bag and store away, fully decorated. Huge time saver. Right now, that very tree is stashed away, fully decorated and just waiting to be plugged in. Well, ha! Jokes on you, baby tree! Okay, that might have been uncalled for. That sad little tree has no idea its been replaced with a 6' tall (plastic) Jackson Spruce (way, way too big for my tiny little living room, by the way)... and it never will, because I don't plan to bring out the tiny tree. Though it would look good on my desk, the decorations would clash with the larger tree and that would be a bummer to my whole scheme. Yeah, this year I have a new scheme. We usually pick colors and run with them, usually red & silver, a touch of gold here and there, traditional Christmas colors. Not this year. This year I'm going with something much more fun. Something much more unusual, as Christmas goes. This year, my tree's color scheme is hot pink, teal, and silver. Yup, hot pink and teal. Matt seriously wins Christmas because he doesn't even mind that our scheme is pink and teal. As a matter of fact, he helped me pick out ornaments (mostly the teal ones). He's a trooper. Clearly he's a believer in the whole "happy wife, happy life" thing. But also, I think he knew that this year I seriously need a pick me up. I've been feeling horrible, which I've been going on and on here of late. Today, a bit of holiday cheer has perked me right up. I love decorating for Christmas. Taking everything down, not so much, but then I don't have to worry about that until after New Years. Not the best pics, I know, but strangely my iPhone 3GS, with no flash, took better pictures than my camera. Fail camera. The issue with my iPhone is that all pics I take inside at night come out a bit yellow because of the light in my house. Sorry. The first one is my tree. The second and third are the garland on my bookshelf. The last picture is only part of a little Christmas tree ornament with bells hanging from it. The ornament was so big, I cut the loop off the top and have it standing on top of the bookshelf. It's much cuter than it looks in this fail picture... oh the things I could do with an iPhone 5 (*pout*). I mean, seriously, not even Photoshop could work its magic on these pictures. But whatever, you get the general idea. Anyway, I usually put up my tree on Thanksgiving day, so a week a head of time isn't much of a leap. I love to see the tree all lit up and now I can add a pretty matching garland to the mix, something I've never bothered with before. I think I need to get one more garland and put it up on the buffet in the kitchen/dining area, then my decor will be complete and I'll be a happy camper. Time to bust out the Christmas music, maybe a bit of "Baby, It's Cold Outside" by Lady Antebellum or Stephen Colbert's "Another Christmas Song" to top off the Christmas spirit! So, I had one of those major "WTF?!?!!" moments yesterday. Here's how it went. My kitchen is a huge mess. I have lots and lots of dishes, but I hate to wash dishes, so I don't do it as much as I should. This creates a bit problem. Dishes everywhere and the bigger the mess, the less likely it becomes that I'll clean it up. This is a vicious cycle. It's the way things always are. When I get it cleaned up all the way, I can't seem to keep it that way because, well, I hate to wash dishes. I have a dishwasher, but it died last December. Like, dead. When I tried to turn it on the lights would just blink at me. Nothing worked. I looked it up online and tried the "reset" they suggested, to no avail. Nothing worked and my dishwasher--which had always been a bit of a piece of crap, if we're being honest--became a really big dish drainer. Okay, it sucked, but at least I could dry and/or hide lots of clean dishes at once. Fine, whatever. Then, a few days ago, we had a power out. It was so brief that we wouldn't have known it had happened if everything wasn't blinking. Of course, we were sleeping--since we sleep during the day like creepers--so it could have been an epic power outage and we wouldn't really know. Anyway, I pushed the clear button on the front of the dishwasher to stop the lights from flashing and the stupid thing reset. I pushed the damn power button to get it to start and it actually came on. My dead dishwasher started to wash. Yes, at this moment I was like... seriously?! Then I was happy, because having a working dishwasher is sort of the answer to my messy, messy problems, but only for a minute. So, I ran it to clean it out (which really didn't do much, need to get dishwasher cleaner) and when that finished I ran a load of dishes. It worked, through two loads. Now, I just need to figure out if it will keep working. Fingers crossed. Because, seriously, I'm a bit lazy about cleaning house. Martha Stewart, I am not. Yeah, um, okay. Back to dishes. You know that old adage about a picture being worth a thousand words? Yeah, right about now, I wish that were true. I could use those words! The proof is the picture below. It's a screen cap of my NaNoWriMo stats to date. Ignore the "genre," it was the best I could do. So stats, impressive right?! Yeah, don't answer that! I'm sure you're capable of reading a graph, but I'm going to point it out anyway, ready? Here goes: I am hopelessly behind. I will never catch up. I have no idea how this happened, since I don't have work or school. I literally have nothing else to do, except spend time with my husband (and right now he's only off one day a week, if he's lucky). Know what I'm doing instead? Hint, it's not cleaning my overwhelmingly dirty house. Mhmm, I'm playing WoW, capturing virtual animals for my collection. So, I started thinking about whether I can catch up, or if I even want to, and I just don't know. I think the fact that I'm not really motivated to do it is getting in the way. Maybe I'll look at my document later and give it some serious thought, maybe I'll even write a word or two. What I won't be able to write is the 10,000 words, or whatever it is to catch up. Might make some progress thought. We'll see. Right about now I'm thinking my time would be better spent cleaning my house. Trust me on this one, if you saw it, you'd understand. Yeah, think I might just go do that... right now. Happy 165th Birthday, Bram Stoker!! Without you, the Gothic world would not be what it is today. Dracula was a unique work of genius and a book I love very much. A book that has inspired the imagination of countless readers and will continue to do so, just as it was inspired by the Gothic tradition to come before it. I'm looking at you, Joseph Sheridan Le Fanu's Carmilla. 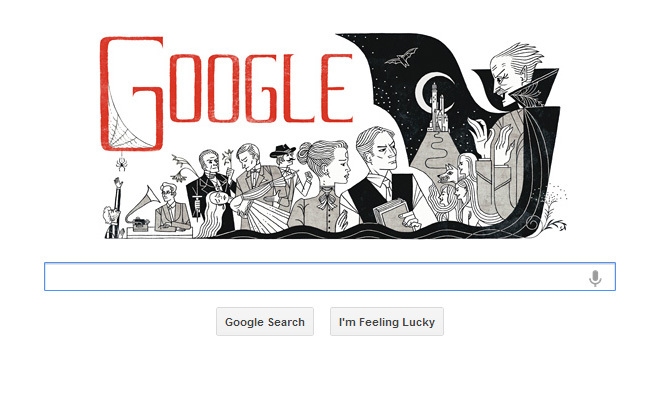 Oh, and check out this fun Google doodle for Stoker's birthday... Very nice work, Google!! Very nice, indeed. I love how well it represents Dracula. 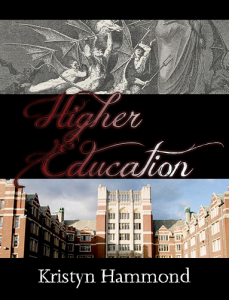 Now, go to Google (November 8th) and click the awesome graphic to see more information on Stoker. For me, seems like the perfect day to start stoker's romance novel, Lady Athlyne. Absolutely blew my mind to find out he'd written a romance! I've mentioned, a few times, that I've been feeling really, really stormy lately. Things are just off and I can't seem to get them back on again. I struggle every day with agoraphobia, social anxiety, and severe depression, but I'm trying to work through it. But tonight, I had a bit of an epiphany. I think it's possible that part of my problem is Seasonal Affective Disorder (SAD). Now, I know it's not a good idea to self-diagnose and I don't much make a habit of it. This particular thing, though, seems so likely that I can't imagine why I didn't see it sooner. It started the other morning when I saw on TV that the time change can cause SAD. Okay, that's not much of a problem for me, though. Then, tonight while I was watching the election results with Melanie & Joey, it came up again. That's when it struck me, like a lightening bolt out of the clear blue (or black) sky. You see, when I was feeling my best I was taking Fluoxetine, working outside the house, and was function on normal daylight hours. My life was bright and productive. I happen to know that working inside the house, particularly since I don't have a car and am therefore stranded, is aggravating my agoraphobia. Being away from people is increasing my fear of going out and, well, around people. That one's easy. The social anxiety is also associated with that. I can't seem to be social without my system going into shock and freaking out. Okay, again, aggravated by not going out and being around people. 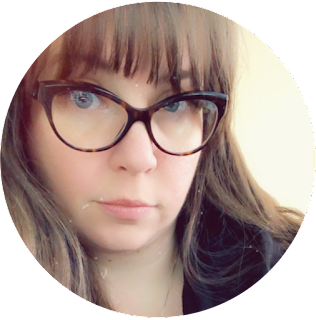 But the depression, which I've struggled with on and off since I was a teenager, I think is being seriously aggravated by my current night schedule. I get up around 3:00 p.m. and go to bed about 6:00 a.m., which means I'm a night owl in the extreme. I adopted this schedule because Matt is working night shifts 7:00 p.m. to 7:00 a.m., and I want to be asleep when he is. I want to be awake when he is, so I can talk to him during his three work breaks through the night. Yet I think that I really started to go downhill when I started spending most of my time in the dark. I have very few hours of sunlight in my life, more so since the time change. It gets dark here about 6:00 p.m. now. So I talked to Matt about it and am trying to transition my schedule back to the daylight hours. Maybe letting some light into my life and being awake during the same hours as everyone else will help me to fight off my depression. I've climbed out of this hole before, I can do it again, I'm strong and capable. Oh, and I'm going to see if my doctor can put me back on Fluoxetine, or something like it, to help the process along. I really hope it works, I need so much to start feeling better. Wish me luck. In a moment of inspiration, I felt inspired to check out Chewbacca's registration papers to confirm his birthday. I knew it was this month, but I thought it was November 29th and I wanted to write about my baby boy turning one. You cannot imagine my surprise to learn that his birthday is not, in fact, the 29th but is actually the 6th. My little guy turned one on election day! So. . . 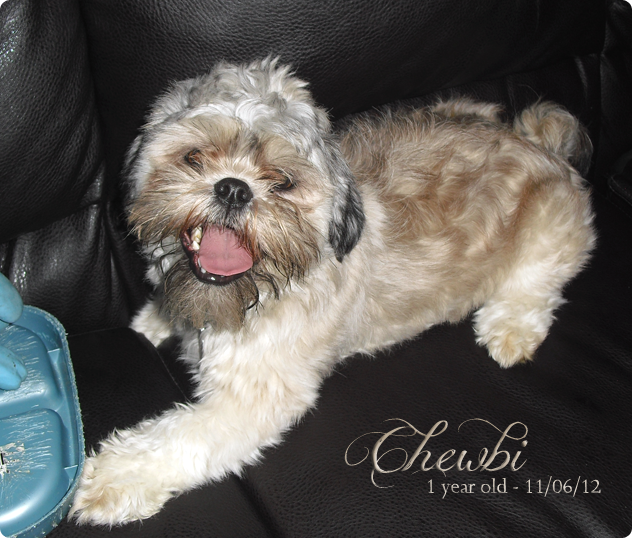 Happy First Birthday, Chewbi. We love you!! Of course, the way I've been feeling lately caused me to get all misty-eyed at the prospect that my puppy, whom I loved and cuddled and raised, is one whole year old. I hugged him and cried for a minute, before I started to get self-conscious about crying on my puppy. Then I tried to catch a picture, which is almost impossible, he's never immobile long enough to get a good picture with my phone. So, I broke out the camera. That face kills me. 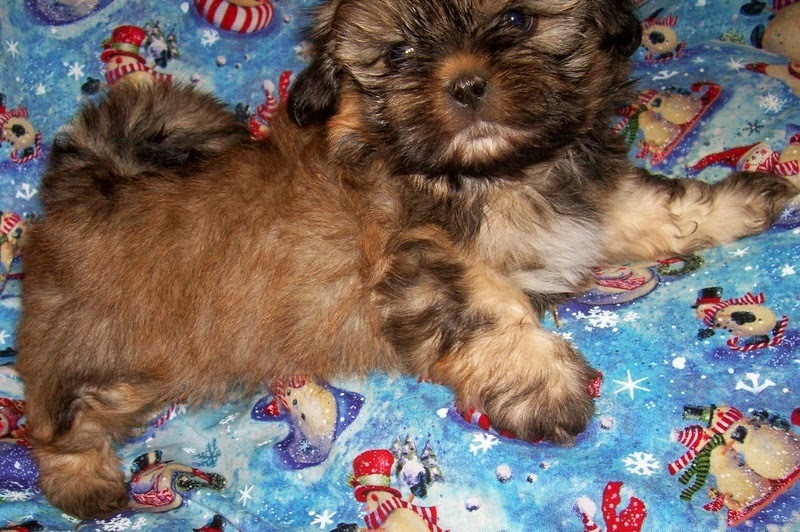 I fell in love with that face the moment I laid eyes on him, via the internet nonetheless. Thank goodness he was in Strahn, which isn't far from him at all--only about 45 minutes! His color is gold and though he's much more gold than he was when he was a baby, he never quite got all the way there. And I just noticed that this picture makes him look like he needs a haircut for all that muzzle fur in his eyes, but it's just the angle. He's not quite there yet. And look, I caught a picture of his bowl, which he eats from and then carries around everywhere with him. He even takes it into the bedroom sometimes and he chews on it mercilessly. I've considered getting him a metal bowl, but why ruin his fun? He loves that one (and the white one just like it) so much! For his birthday, we got him a toy and a box of cupcakes. I know he shouldn't eat that, but he and Ani love that stuff and they don't get it frequently enough to hurt them. Besides, it's a celebration! I may be afraid of the outcome of this election, but I always love Election Day! I love the process of voting, I love waiting in a (short) line to take my turn at democracy. It's the one day, every four years, that I feel like I count. So when we got up this afternoon, we went to the Erath County Courthouse and voted. And what a beautiful day to do so, too! The pictures sort of tell the tale. Our courthouse is so wonderful, a truly lovely structure and one I love. I love the courthouses in Texas so much, in fact, that Matt and I got married in one--in Waco. They just have history and truly stand as monuments. Love them! And you know, I love that our stickers this year have a balloting machine on them. Very appropriate. All of this is among the reasons that I don't vote early. I feel like it takes away from the experience. Voting on November 6th with the majority of Americans is taking part in something we all, as Americans, share together regardless of party affiliation. I hope, wherever you are, that you've taken time today to share in the most American process and voted. I plan to spend the evening at home, watching election results. Matt has to work, so he won't be here with me, something he regrets. He loves Election Day, too! Saw this on Facebook. Given my propensity toward all things Gothic, I love the feel of this poster. It's probably the most creative thing I've seen this campaign cycle--which I'm grateful is nearly over. This Thanksgiving, when I'm saying what I'm thankful for, that'll be one of them, along, hopefully, with the re-election of the president. And really, as glad as I'll be when it's over, because the level of divisiveness in this country during election years is frightening, I have never been more afraid of the potential outcome. Yet whether you agree with this poster, or my political persuasion, or not, I hope you'll get out tomorrow and exercise your most significant constitutional right. 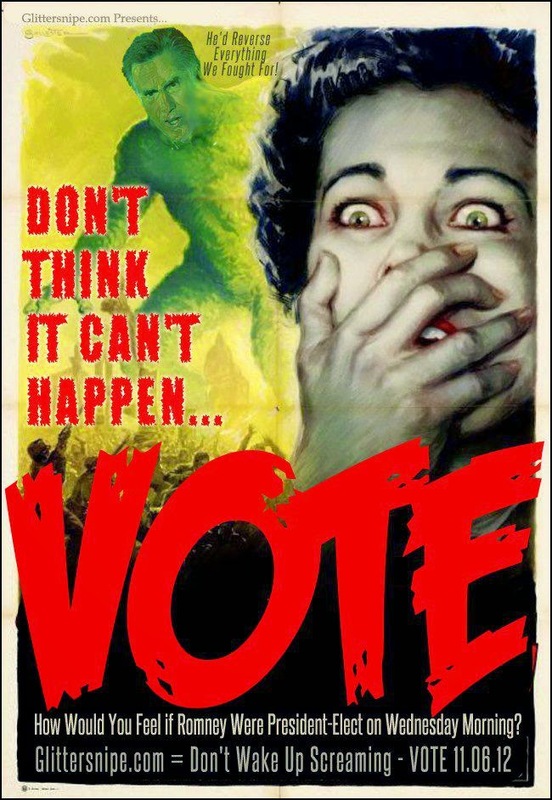 I hope you'll vote and make sure your voice is heard. I think that it happens too often in this country that people feel marginalized by all the chatter about swing states and even more so by our fellow American's who think it's okay to tell people they should leave America if they don't share their political views. They're not the only voices, they're not the only ones that count, we all count, every single American counts whether we're liberals or conservatives. I plan to go out tomorrow and make my voice heard. You should too. So, I gotta say, NaNoWriMo is off to a good start this year. Well, for me anyway--poor Matt's got a lot of overtime at work, but is still trying to participate with very little time to do so. The daily word goal for finishing 50k in 30 days is about 1,667 per day. So far, my word count for the first two days only is 3,895! So far, I'm a couple of hundred words per day ahead of schedule and while I'm tempted to say that won't last for long, I'm trying my hardest to be optimistic that I'll hang in there and stay a couple hundred (or more) words ahead. I think things are working out so well so far because I got off to a good start. I went to the local NaNoWriMo kick-off party and had a really good time. I wasn't able to stay long, I left about 1:00 a.m. to take Matt lunch and then had to go to Wal-Mart, so I wasn't able to get back around to the party again. But, I since I got there at about 10:00 p.m., I got to stay a good three hours. And the picture above is of me and my NaNoWriMo goodie bucket. The ML for our region got us all little metal buckets filled with goodies and got stuff to decorate them. So, while we waited for the stroke of midnight, when we'd all turn into pumpkins... or something like that... we worked on that. The other side of my bucket says "NaNoWriMo" and has more foam heart stickers. Creative, I know, but it was actually quite fun! And you know, I'm pretty proud of myself. Not only is it a pretty good picture of me, but it proves, to me and everyone else, that I sucked up my (profound) fear and went to the party. I went out, alone, in the middle of the night, to a perfect stranger's house, to share in one of my crazier hobbies (NaNoWriMo) with others who do the same. I gave my anxiety, and the intense feeling of nausea, and the uncontrollable shaking the finger and went out and had fun. Go me. What was nicest, though, was meeting a few of the other locals who also do NaNoWriMo and finding out there're events throughout the month. I'm not certain how many of them I'll make, but I'm going to try to make a few more at least. I feel like having a social environment during NaNoWriMo could be a pretty productive thing, so I wish I could make it to all of them, but that's just not possible with Matt's schedule being what it is. He's working 84 hours in the next 7 days, and when we factored it, we'll only see one another about 20 hours in the same period of time. So, I can't see my way to going out and away from him in the very few hours we have together, especially since his working 84 hours in 7 days means that I'll be alone for 84 hours in the next 7 days. Boo. It should, though, give me a lot of alone time to work on my novel. That's not a bad thing, since when Matt and I are together we tend to take up one another's time. When he's home, I want (generally) to spend time with him. He feels the same, so we tend to blow everything else off in favor of time together. Eshewing other activities isn't a good thing during NaNoWriMo, though I'm proud of us because today, when we got up we got right to work writing together. Of course, that pride has also made me feel a bit depressed and empty because the few hours we had together today were spent not saying a word to one another. Double boo. So there you have it. NaNo is going well, the NaNo kick-off party was quite fun, and I had a good time. Nothing more to say, so for now I'm going to go add to that word count. I'm thinking 8k by the end of the weekend (har har... I'm such an optimist sometimes!). Good night.